Renovating a farmhouse in France is not at all like Under the Tuscan Sun. It IS an idealistic and creative endeavor of the largest proportions! It is also dirty, dusty, sweaty, cobwebby, batshitty, and VERY hard work! Joe Atkins had a dream, to someday renovate or build a home. Joe's career as a lighting designer for theater, film, concerts, exhibitions and conferences gave him the myriad necessary skills to build a house. What he doesn't know, he researches, often on YouTube! I also shared this dream, yet I have few skills. 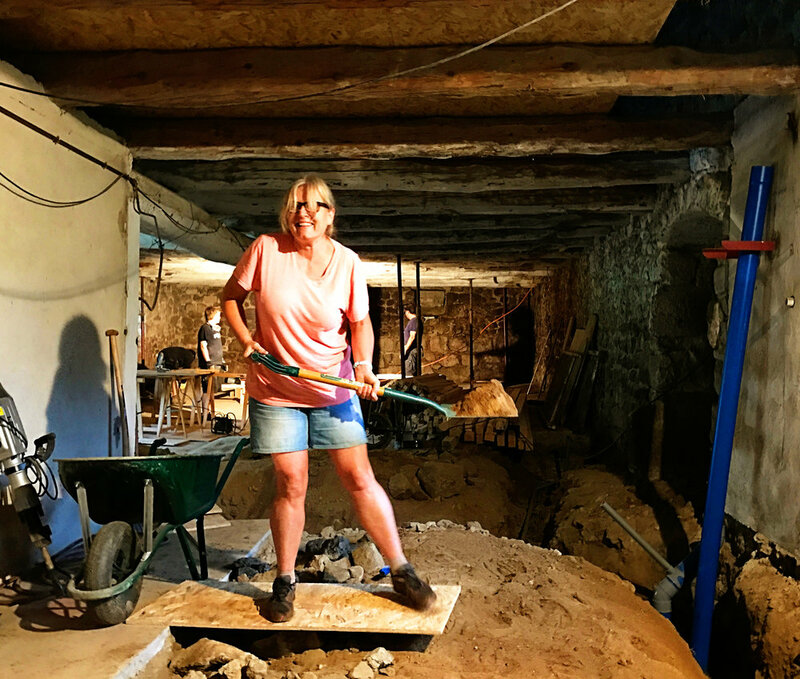 When my dear English friends Joe and his wife Manny said they bought an old farmhouse in the Ardèche in central France, a frisson surged through my system and I knew I'd volunteer on the project. Fast forward to April 2017. The Atkins assisted with my visa paperwork, then welcomed me into their home, setting up a room for me in the house they rent in Bas-en-Basset (also a converted farmhouse) and helping me buy a car. I settled in to life in the French countryside. Most impactful to my system were the sounds ... Waking to the song of warblers, swallows, and roosters, counting time by the chimes of church bells, doves cooing and sheep bleating in the afternoons, and the absence of traffic noise. I found myself weirdly drawn to lying in the grass, in the backyard or in the field at the farmhouse ... something I never do at home but which I let myself do those first weeks in France, a sign that my body needed rest and my soul needed grounding. I also enjoyed living with this very special family. Most days, some configuration of the family and I -- whomever was available -- set out on the 45 minute drive to the little hamlet of Solignac outside of Tence to work. For me, the roads all looked a bit the same with green fields all around, pine trees at higher elevations, stone farmhouses. My landmarks were the cows, sheep, horses, donkeys, and chickens along the way ... penultimate picturesque countryside, the kind in fairy tales. The work was rewarding, progressing each day. My main job had me up on the scaffolding (échafaudage, or "the tower" as Joe calls it), working my way along the ceiling of the barn (grange), cleaning the wood beams (poutres) with wire brush (brosse métallique), airgun (pistolet à air), and sandblaster (sableuse). The work was also physically exhausting for my body which was more used to spending much of my day sitting at a computer. A handful of Advil became part of my daily regimen. After two months of working and several visits to an ostéopathe (and one to a sorcière! ), I decided to see a docteur ($25 for a 45 minute visit, thanks to the comprehensive French medical care system!) for the unremitting pain in my neck, shoulder, arm, and uncomfortable tingling in my fingers. He diagnosed me with NCB (nevro-cervical brachialgie) or CBN in English, otherwise known as sciatica of the arm, otherwise known as a pinched nerve. I had x-rays to confirm the diagnosis. Three prescriptions later (at a mere $3 a pop), I had to stop work, doctor's orders. I salute the Atkins family who are working diligently to achieve their dream. They are a team that works and plays together with such joy, enthusiasm, positivity, and gusto. So grateful to have been a part of the project! Bon boulot et bon courage, mes amis! PS - As part 2 of phase 1 of my gap year, I'm recuperating in Provence at the home of my French exchange student family whom I've known since I was 16, in preparation for the start of my farming internship in August. Not a bad spot for rest and rejuvenation!